New fish species discovered nearly 8km beneath Pacific Ocean – and it would MELT if brought to surface. Three new species of fish have been found living in the pitch-black waters of the Atacama Trench, one of the deepest parts of the ocean. An international research team used baited camera traps deployed in the south east Pacific Ocean to reveal the mysteries of this largely unexplored region. Despite the freezing cold and extreme pressures 7,500m (24,606 feet) down, the scientists found the trench was teeming with life. Among the creatures they observed flocking around their bait were three new species of snailfish, animals with soft, translucent bodies well adapted to life in extreme conditions. Dr Thomas Linley, one of the team members based at Newcastle University, said at these depths the snailfish are able to live free of competitors or predators. “As the footage clearly shows, there are lots of invertebrate prey down there and the snailfish are the top predator, they seem to be quite active and look very well-fed,” he said. “Their gelatinous structure means they are perfectly adapted to living at extreme pressure and in fact the hardest structures in their bodies are their teeth and the bones in their inner ear which give them balance. Dr Linley has previously described another snailfish – the Mariana snailfish – which is able to live further down than any other fish, at nearly 8,200m (26,903 feet) deep. 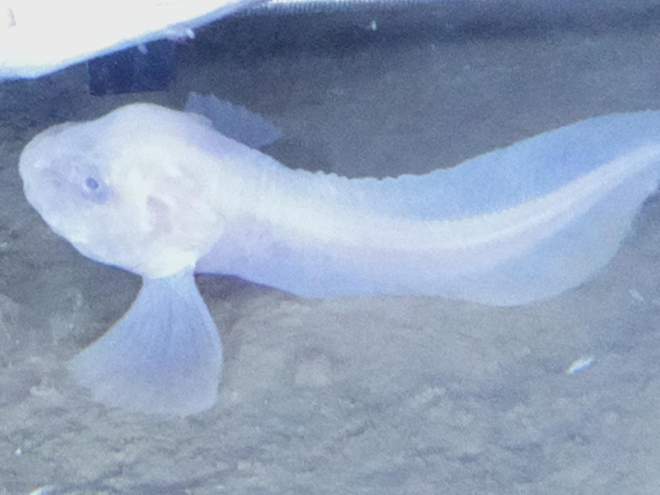 Nicknamed the “pink, the blue and the purple Atacama snailfish”, the new species were all identified by the team after they analysed over 100 hours of video footage and 11,468 photographs taken on the sea floor. One of their traps also managed to catch a snailfish that was then transported to the surface, where its remains are being preserved and analysed. The team have been working on their “lander” trap systems, developed in Newcastle, as a means to explore ultra-deep regions for the past five years. Their latest expedition saw them target the Atacama Trench, which runs along the western coast of South America for almost 6,000km (3,728 miles). The system is dropped overboard and cane take up to four hours to sink to the bottom. Once there, it is equipped with HD cameras, bait and traps that allow the researchers back on land to capture a vivid picture of trench life. Besides the elusive snailfish, the scientists also managed to capture rare film of long-legged crustaceans known as munnopsids, which are around the size of a human hand. These findings are being presented at the Challenger Conference at Newcastle University this week, where marine scientists gather to share their latest research.